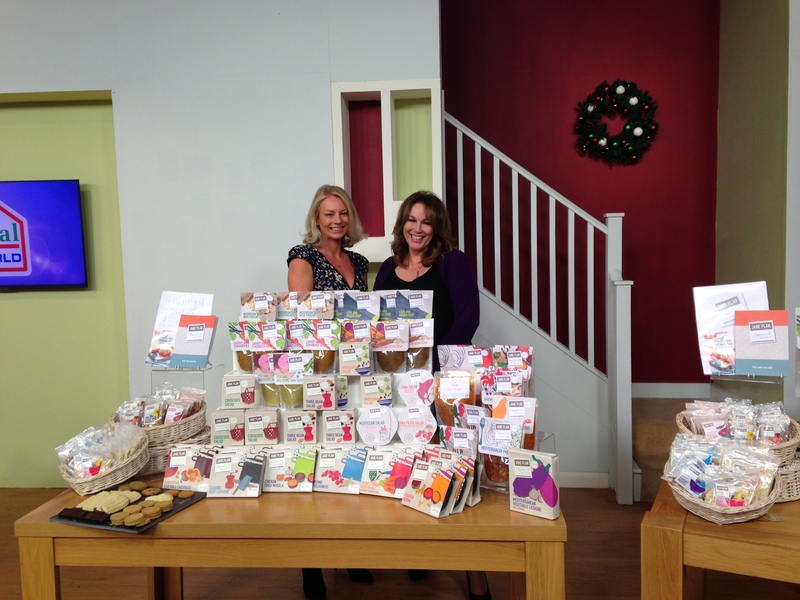 As some of you may know, I made an appearance on Ideal World on Thursday last week to talk about the Jane Plan Diet. Appearing on live television was a really fun experience, although I was a little nervous about it before starting! It was a little bit stressful as Fiona and I had to prepare the food before the show, and we were worried it didn’t look great under the lights! I also had to prepare some food live, and originally mistook the oven for the microwave before realising where the microwave was and averting disaster! However, after the experience I was able to relax and watched The Lion King at the West End, after eating a burger at Byron! Ideal World was a really good opportunity to discuss the Jane Plan Diet, and we had the lovely Sharon Strange, a client of ours, come in to discuss her experience of the plan, and how she lost almost 3 stone. One of the highlights of the show was a client, Stephanie Dearlove, emailing in to give positive feedback on the Plan. It was a complete surprise – thank you Stephanie. I called her afterwards to say thank you and she told me she loved Jane Plan so much, she felt compelled to spread the word. This was so lovely and I want to thank everyone for your support as our company continues to grow. On this note, I am appearing on Ideal World again next week and it would be lovely to have another client who would be able to talk about their experience live on TV. So if any of you are interested please get in touch! As the clocks go back this Sunday, it is easy to start thinking about the cold winter days and feel down! The cold and dark makes us more likely to indulge in unhealthy, high-calorie meals, so-called ‘comfort food’. It’s a familiar situation to all of us; lying in our pyjamas under a warm blanket watching Netflix, a piping hot plate of shepherd’s pie on our lap. As you all know, I love food and sometimes food should be warm and comforting! By checking your calorie bank account you can indulge in some slightly higher calorie meals which are still balanced and healthy. Eating the right comfort food can also fill you up for longer, making you less likely to snack. Here are the recipes of three of my favourite comfort food dishes to will fill you up this Autumn/Winter. A vegetarian soup perfect for warming you up this Halloween. Preheat the oven to 200°c/Gas 6. Put the butternut squash and pumpkin in a roasting tin, drizzle over 1 tbsp of the oil and season. Roast for 25-30 minutes until golden brown, turning occasionally. Put the onion in a large pan over a medium heat with the remaining oil and add the carrots, celery and garlic with the curry powder. Cook for 4-5 minutes until softened. Add the roasted butternut squash and pumpkin to the pan, then pour over the vegetable stock. Bring to the boil, then cover and simmer for 20-30 minutes until all the vegetables are tender. Purée the soup in a food processor until smooth. Season with salt and pepper. Transfer the soup to a clean pan and stir in the crème fraîche. Serve in warm bowls and sprinkle with pumpkin seeds and some thyme leaves. Jane Tip: it’s really annoying to have half a butternut squash and half a pumpkin left over, so it’s a good idea to double up here and make the twice the amount. It freezes really well and you can save it for a rainy day. This is one of the first dishes on the Jane Plan menu and is a favourite with Jane Plan clients. 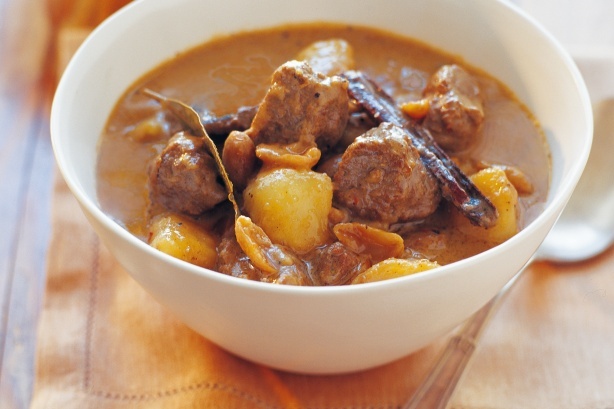 It’s the perfect curry to warm you up. Preheat the oven to 180˚c/Gas 4. Heat 2 tbsp of the coconut milk in a large flameproof casserole with a lid over a medium heat. Add the curry paste and fry for 1 minute, then stir in the beef and fry until well coated and sealed. Stir in the remaining coconut milk with half a can of water, the potatoes, onion, lime leaves, cinnamon, tamarind, sugar and fish sauce. Bring to the boil, then cover and cook in the oven for 2 hours or until the beef is tender. 20 minutes before the end of the cooking time, cook the rice in a pan of boiling water, according to the pack instructions. Remove the casserole from the oven and squeeze the lime juice into the curry, then gently stir. Scatter the sliced chilli on top and serve with the rice and lime wedges. Jane Tip: if you leave out the rice you can save 180 calories per person. Simply one of my favourite comfort dishes. Heat the oil in a large pan over a medium heat for 1-2 minutes until hot. Add the onion and cook, stirring frequently, for 5 minutes. Add the garlic, red pepper and chilli powder. Stir well then cook for another 5 minutes, stirring occasionally. Increase the heat to medium-high and add the minced beef. Using a spatula or wooden spoon, break up the mince as it fries and browns – make sure you keep the heat hot enough for the meat to brown rather than stew. Pour the stock into the pan and add the tomatoes and tomato purée, marjoram and sugar. Season and stir the sauce well. Bring to the boil then reduce the heat to low until it is gently simmering. Cook for 20 minutes. Check the pan occasionally to make sure that the sauce doesn’t catch on the bottom or isn’t drying out. Add 1-2 tbsp water, if needed. Add the kidney beans and simmer for 10 minutes, adding a little more water if it looks too dry. Taste the chilli and adjust the seasoning; add extra chilli powder, if needed. Cover the pan, turn off the heat and leave the chilli to stand for 10 minutes before serving to allow the flavours to mingle. While the chilli is resting, cook the rice according to the pack instructions. Serve the chilli with the rice. Jane Tip: If you’re wondering why this dish is relatively high in calories, it’s the rice. Without rice, this recipe is only 349 calories, but for many people the dish would not be nearly as delicious this way. As an alternative you could combine it with cauliflower rice and reduce the calorie content, but this is for you to judge by keeping track of your calories. I hope that these three recipes have given you ideas of comfort food to try this Autumn/Winter, and shown that you can eat good food without it being too high in calories! 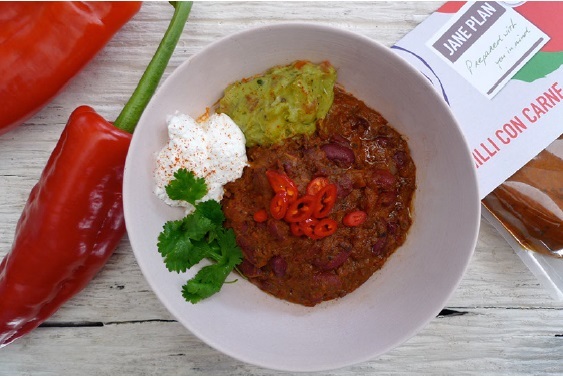 If you want more ideas, check out my book The Jane Plan Diet, which has loads of healthy and balanced recipes for all year round. Have a lovely weekend cooking! Here at Jane Plan, our daily focus is on food and diet and the task of making sure that people eat the right food in order to reach and maintain a healthy weight and lifestyle. 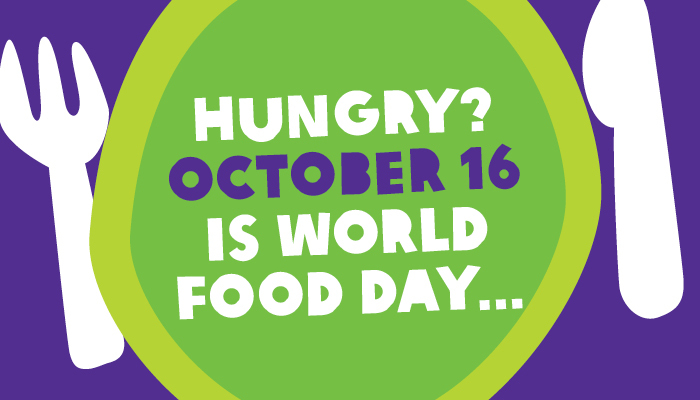 With this task in mind, World Food Day is something Jane Plan feels passionately about, and why I am proud and excited that we are marking the day by donating £5 for every order placed today to the charity Food Cycle. World Food Day was established in 1979, and its aims to remind us in the developed world to take action towards the eradication of hunger. Looking at some of the figures showing the extent of world hunger, it is easy to be overwhelmed by the sheer scale of the problem; one in nine people on Earth do not have enough food to lead an active, healthy life. In the UK alone, around 4 million people are affected by food poverty. 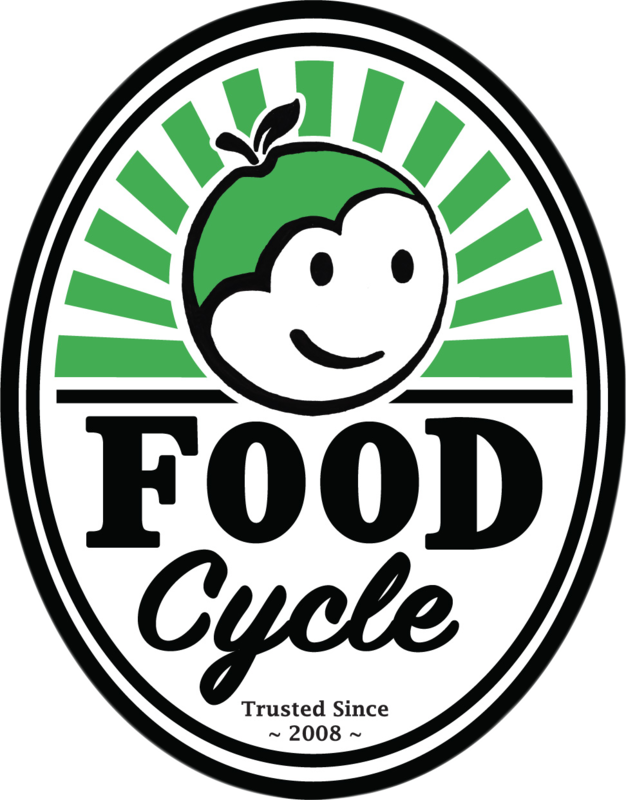 However it is encouraging that charities such as Food Cycle are tackling this issue in the UK. It runs 20 projects nationwide which aim to provide nutritious and delicious food for people at risk of food poverty and social isolation, by serving surplus food from supporting restaurants and companies. This campaign is supported by all of us at Jane Plan, for its simplicity and effectiveness. At Jane Plan and in my down-time, I love to experience as many cuisines, food trends and quirky ingredients as possible. It’s so important to open your mind to the possibilities of trying news foods, not only for your palette, but your mind too. I find that when a person eats new things, they find out more about the country of origin and different cultures. The ease of trade and travel, and the freedom of movement of people means that we really can enjoy cuisines and influences in any given city. On a recent trip to Zanzibar, I came away truly inspired and refreshed. The trip took in something really important and that was to look at locally sourced produce and organic production. I think that it’s really important to know where your food is coming from, and to meet local farmers and workers in Zanzibar was truly something. As a business owner, I also think that it’s really important to source produce locally when you can and ingredients responsibly and ethically. It’s an ethos that is central to Jane Plan. It’s not just about doing this in the UK, it’s about looking world-wide. I know I’ve come back with lots to think about, new ideas and ways of doing things. I hope you enjoy the selection of pictures from the trip – of course they are foodie based! A visit to a spice plantation was a big highlight; I saw ginger growing, which as many of will know is fabulous for calming the digestive system, good for easing bloating and an inflammatory, bananas on trees, which grow in abundance in Zanibar and have so many nutritional benefits like being rich in potassium and magnesium. One fruit that I hadn’t seen before was the Jack Fruit, the largest tree borne fruit in the world and researchers have suggested it could replace wheat, corn and other staple crops that may come under threat because of climate change. So this weekend when I’m in the supermarket I’ll be viewing the produce with fresh eyes. It’s a question that many of us ask ourselves, including myself over the years! One thing is for sure, we all want insider knowledge and health and diet tips that really work, don’t we? Well, I was approached by Love Sunday magazine to share some nuggets of advice on the very question above! A recent study by Cornell University showed that simply reducing your plate from a 30cm size to 25cm can reduce calorie consumption by 22%.Using a smaller plate is less disheartening because the portions you are eating will appear much larger. You feel ravenous when you get home and immediately reach for food but sometimes our bodies confuse thirst with hunger. Having a glass of water first will avoid this happening. catch up with the signals from your digestive system. Hungry shoppers buy more calories! Go shopping after dinner and you’re more likely to stick to your shopping list. so next time you have a craving you’ll reach for healthy alternatives instead. Increase your salad or veg portion to half a plate. Not only are veggies nutritious and delicious, but they’re low in calories and high in fibre so they will help keep you full for longer. I hope these tips help. I know that they have worked for me!